If someone you recommend signs up for QTel service, you may receive a $50 credit on your invoice. 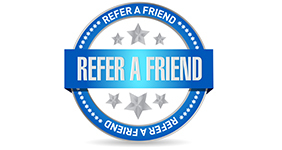 There is no limit to the number of businesses you can recommend or the number of $50 credits you may receive. * You must meet eligibility and other requirements. Please read Referral Program Terms & Conditions. * I, am not an employee of QTel, and to the best of my knowledge the business I am referring is not a current QTel client.